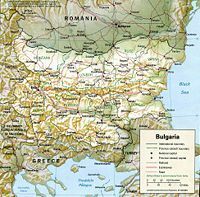 Bulgaria is a Balkan country in eastern Europe, a former member of the old Warsaw Pact, and now a current member of NATO. Bulgaria shares a border with Turkey and Greece to the south, Macedonia and Serbia to the west, Romania to the north, and the Black Sea to the east. The capital, Sofia, lies in the western region of the country. Area: 110,910 km2. (slightly larger than Tennessee). Major cities: Capital—Sofia 1.2 million. Terrain: varied, containing large mountainous areas, fertile valleys, plains and a coastline along the Black Sea. Climate: Continental—mild summers and cold, snowy winters. Ethnic groups (2001): Bulgarian 83.94%, Turkish 9.42%, Roma 4.68%, and other 2% (including Macedonian, Armenian, Tatar, Circassian). Health: Life expectancy (2006)--male 68.68 years; female 76.13 years. Infant mortality rate (2006)--19.85 deaths/1,000 live births. Work force (2005 est. ): 3.34 million. Agriculture—11%; industry—32.7%; services—32% (3rd qtr. 2004 est.). Bulgaria is a parliamentary republic. The unicameral National Assembly, or Narodno Subranie, consists of 240 deputies who are elected for 4-year terms through a system of proportional representation in 31 electoral regions. Party or coalition lists, rather than individual candidate names, appear on the ballots. A party or coalition must garner a minimum of 4% of the vote to enter parliament. Parliament selects and dismisses government ministers, including the prime minister, exercises control over the government, and sanctions deployment of troops abroad. It is responsible for enactment of laws, approval of the budget, scheduling of presidential elections, declaration of war, and ratification of international treaties and agreements. A one-month official campaign period precedes general elections. The voting age is 18. Preliminary results are available within hours of poll closings. Seats in parliament are allocated both by vote and by voter turnout. The votes for parties who did not receive a minimum threshold of votes are redistributed to other parties proportionate to their own share of the vote. The lists of newly elected members of parliament are announced 7 days after the elections. The president must convene the new parliament within one month after the elections, and calls upon parties, coalitions, or political groups to nominate a prime minister and form a government. If the three largest parties, coalitions, or political groups fail to nominate a prime minister, the president can dissolve parliament and schedule new elections. In recent years, it has taken approximately a month for the new government to form. Peter Morozov, Defending the banner at Stara Zagora, 1909. A general election in Bulgaria was held June 25, 2005. Results are as follows: Coalition for Bulgaria (CfB) 31.1%, National Movement Simeon II (NMSS) 19.9%, Movement for Rights and Freedom (MRF) 12.7%, Ataka 8.2%, United Democratic Forces (UDF) 7.7%, Democrats for Strong Bulgaria (DSB) 6.5%, Bulgarian People's Union (BPU) 5.2%. In May 2007, Bulgaria held its first elections for members of the European Parliament. The GERB (Citizens for European Development of Bulgaria) party, led by Sofia Mayor Boyko Borisov, won the vote by a narrow margin over the Socialists (BSP) and secured 5 out of 18 seats. The BSP won 5 seats, the MRF won 4 seats, Ataka won 3 seats, and Simeon Saxe-Coburg Gotha's NMSS won 1 seat. The president of Bulgaria is directly elected for a 5-year term with the right to one re-election. The president serves as the head of state and commander in chief of the armed forces. The president is the head of the Consultative Council for National Security and while unable to initiate legislation, the president can return a bill for further debate. Parliament can overturn the president's veto with a simple majority vote. Bulgarian Socialist Party candidate Georgi Parvanov won the November 2001 presidential election and was re-elected in October 2006 as an independent candidate in a run-off against Volen Siderov, the leader of extreme nationalist Ataka Party. The Bulgarian judicial system became an independent branch of the government following passage of the 1991 constitution. Reform within this branch was initially slow. In 1994, the National Assembly passed the Judicial Powers Act to further delineate the role of the judiciary. In 2003, Bulgaria adopted amendments to the constitution, which aimed to improve the effectiveness of the judicial system by limiting magistrates' irremovability and immunity against criminal prosecution. The Supreme Judicial Council (SJC) is composed of 25 members serving 5-year terms. Those who serve on the council are experienced legal professionals and are either appointed by the National Assembly, selected by the judicial system, or serve on the SJC as a result of their position in government. The SJC manages the judiciary and is responsible for appointing judges. In 2007 parliament revised the Judicial Powers Act to make it compliant with the latest constitutional amendments, which provided for the establishment of the Inspectorate with the Supreme Judicial Council: a standing body with 11 members who oversee the activity of all magistrates with no right to rule on the substance of judicial acts. Bulgaria became a member of the North Atlantic Treaty Organization on March 29, 2004, and a member of the European Union on January 1, 2007. Bulgaria is a member of the United Nations and in 2002-2003 served a 2-year term as a nonpermanent member on the UN Security Council. Bulgaria served as Chair-In-Office of the Organization for Security and Cooperation in Europe (OSCE) in 2004. Bulgaria joined the World Trade Organization in 1996. In July 1998, Bulgaria became a full member of the Central European Free Trade Agreement (CEFTA), which called for the reduction of tariffs by 2002 on most industrial and agricultural goods traded between CEFTA countries. Bulgaria has initialed free trade agreements with Turkey, Macedonia, Croatia, Lithuania, Estonia, Israel, Albania, and Latvia. Bulgaria's relationship with its neighbors has generally been good. Bulgaria has proven to be a constructive force in the region and has played an important role in promoting regional security. Pursuing its initiative as a partner in the South-East European regional cooperation, Bulgaria has taken over the chairmanship-in-office of the South-East European Cooperation Process (SEECP) for the period May 2007-May 2008. Bulgaria became a member of NATO on March 29, 2004 after depositing its instruments of treaty ratification. Bulgaria's military is currently undergoing an ambitious restructuring program aimed to bring the army up to NATO standards and modernize equipment. In 2007, constitutional amendments annulled military conscription, thus allowing the Bulgarian army‘s transformation to an all-volunteer force. GDP (2008 est. ): $49.8 billion. Real GDP growth: 6.0% (2008); 6.2% (2007); 6.3% (2006); 6.2% (2005); 6.6% (2004); 5.0% (2003). Per capita GDP (PPP, 2007 est. ): $11,300. Inflation rate: 7.8% (2008); 12.5% (2007); 6.5% (2006); 5% (2005); 6% (2004); 5.6% (2003). Unemployment rate: 5.6% (2008); 7.7% (2007 average); 6.62% (November 2007); 9.61% (2006 average); 11.5% (2005); 12.7% (2004 average); 14.25% (2003 average). Official exchange rate: Lev per $1 U.S.=1.34 (2008); 1.42 (2007 average); 1.56 (2006 average); 1.57 (2005 average); 1.58 (2004 average); 1.73 (2003 average). Under the leadership of former Prime Minister Ivan Kostov (UDF), who came to power in 1997, an ambitious set of reforms were launched, including introduction of a currency board regime, bringing growth and stability to the Bulgarian economy. The currency board contained inflationary pressures and the three-digit inflation in 1997 was cut to only 1% in 1998. Following declines in GDP in both 1996 and 1997, the Bulgarian Government has delivered strong, steady GDP growth in real terms in recent years. Prime Minister Simeon Saxe-Coburg's economic team of young, Western-educated financiers continued to implement measures that helped sustain stable economic growth and curb unemployment. Measures introduced by the government were targeted at reducing corporate and individual taxes, curtailing corruption, and attracting foreign investment. The government also restructured the country's foreign debt, revived the local stock market, and moved ahead with long-delayed privatization of some major state monopolies. As a result of this progress, in October 2002 the European Commission declared Bulgaria had a "Functioning Market Economy." Bulgaria's current government has continued these reforms, and in 2007 the country joined the European Union. According to the World Bank, in 2006 Bulgaria attracted the highest levels of foreign direct investment, as a share of GDP, among Eastern European countries. In early 2007, to attract additional foreign investment, the Bulgarian Government lowered corporate tax rates to 10%, reportedly the lowest rate in Europe. The government has decided to introduce a flat-tax rate of 10% for personal income, effective January 1, 2008, which will further decrease domestic labor costs and help reduce the share of the "gray" economy. In response to local governments' demand for financial independence in 2006, parliament passed fiscal decentralization of municipalities, thus further enhancing local economic stability. Despite Bulgaria's many marked successes, organized crime and corruption remain problems. In 1018, the Byzantine Empire conquered Bulgaria. In 1185 the Bulgarians broke free of Byzantine rule and established the Second Bulgarian Kingdom. A number of Bulgaria's famous monasteries were founded during this period. Following the 1242 Mongol invasion, this kingdom began losing territory to its neighbors. Ottoman expansion into the Balkan Peninsula eventually reached Bulgaria, and in 1396 Bulgaria became part of the Ottoman Empire. During the five centuries of Ottoman rule, most of Bulgaria's indigenous cultural centers were destroyed. Several Bulgarian uprisings were brutally suppressed and a great many people fled abroad. The April uprising of 1876, the Russo-Turkish War (1877–78), and the Treaty of San Stefano (March 3, 1878, the date of Bulgaria's national holiday), began Bulgaria's liberation from the Ottoman Empire, but complete independence was not recognized until 1908. Bulgaria had a mixed record during World War II, when it was allied with Nazi Germany under a March 1941 agreement. The Law for the Protection of the Nation, enacted in January 1941, divested Jews of property, livelihood, civil rights, and personal security. Despite a February 1943 agreement requiring Bulgaria to transfer Bulgaria's Jews to Nazi extermination camps in Poland, Bulgaria did not actually deport any Bulgarian Jews or Roma to Nazi concentration camps. Under that agreement, however, Bulgarian forces transferred approximately 11,000 Jews from Bulgarian-occupied territory (Thrace and Macedonia) to Nazi concentration camps. In June 1943 the government "re-settled" Sofia's 25,000 Jews to rural areas. Tsar Boris—supported by the parliament (especially its prominent Deputy Speaker, Dimitar Peshev), the Orthodox Church, and the general public—aided the Jewish community and helped its 50,000 members survive the war, despite harsh conditions. The Bulgarian Jews remained safe, and when they were permitted to emigrate to Israel after the war, most of them did. As Bulgaria emerged from the throes of communism, it experienced a period of social and economic turmoil that culminated in a severe economic and financial crisis in late 1996-early 1997. With the help of the international community, former Prime Minister Ivan Kostov initiated a series of reforms in 1997 that helped stabilize the country's economy and put Bulgaria on the Euro-Atlantic path. Elections in 2001 ushered in a new government and president. In July 2001, Bulgaria's ex-king Simeon Saxe-Coburg-Gotha became the first former monarch in post-communist Eastern Europe to become Prime Minister. His government continued to pursue Euro-Atlantic integration, democratic reform, and development of a market economy. Bulgaria became a member of the North Atlantic Treaty Organization on March 29, 2004, and a member of the European Union on January 1, 2007. Following June 2005 general elections, Sergei Stanishev of the Bulgarian Socialist Party became the new Prime Minister of a coalition government on August 16, 2005. In October 2006, Georgi Parvanov, the former leader of the Bulgarian Socialist Party, became the first Bulgarian president to win re-election. Despite his limited constitutional powers, President Parvanov has played an important role in helping to ensure a consistent, pro-Western foreign policy. The Stanishev government has continued Bulgaria's integration with the Euro-Atlantic world and its close partnership with the U.S. Bulgaria is attracting large amounts of American and European investment, and is an active partner in coalition operations in Iraq and Afghanistan as well as in UN-led peacekeeping operations in the Balkans. The American University in Bulgaria (AUBG) is a fully accredited university through the New England Association of Schools and Colleges (NEASC) and the Bulgarian National Evaluation and Accreditation Agency. The AUBG is a liberal arts university and was established in 1991 as the first venture of a western university system in the old eastern bloc. It is located in Blagoevgrad, in the Blagoevgrad Province of southern Bulgaria. This page was last modified on 13 September 2018, at 12:48.